Party on the water and get a little exercise too! 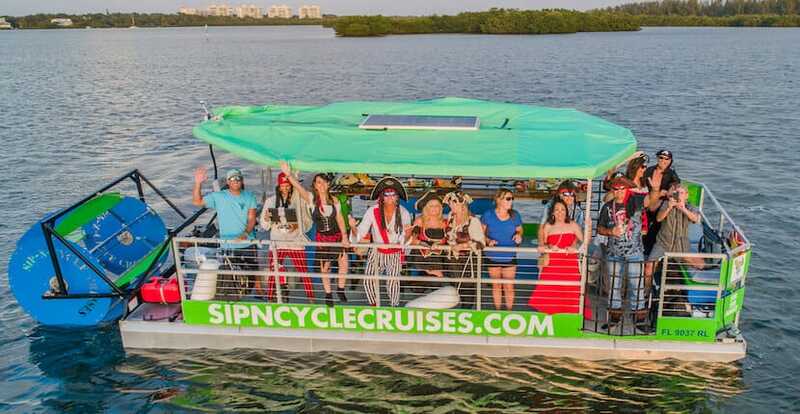 Each Sip-N-Cycle Cruises boat can accommodate up to 16 guests–ten at pedal stations surrounding a central bar, and six others on bench seating. The boat’s two coolers are fully stocked with ice to keep your drinks cold. Guest can bring up to 36 oz. of beer (cans only please) or 18 oz. of wine (three 12 oz. beers or a 6-pack of beer to share between two guests, or a bottle of wine to share between two guests). 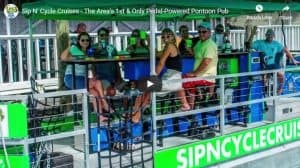 Beverages are also available for purchase at Pop’s Sunset Grill and Bayfront Excursions prior to departure. The boat’s two coolers are fully stocked with ice to keep your drinks cold. There is no bathroom on board, but there is a bathroom stop mid-way through the cruise. The boat is fully covered and tours are offered rain or shine.